What does the Inclusivity Badge mean to me ? 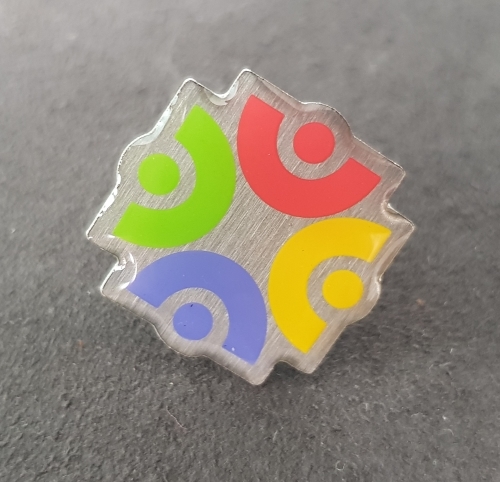 Having received my colourful, new inclusivity badge, I started to reflect what this actually means … sure – being ‘inclusive’ and all that – but what is the actual message behind this rather trendy term? I started my Swansea University journey as a Transcription Co-Ordinator at the Transcription Centre (or ‘Recording Centre for the Blind’ as it was called then) in 2005 supporting visually impaired students by providing accessible resources such as large print, braille, audio recordings and tactile diagrams. Just looking at the terminology of the previous sentence, you can see how our inclusive agenda has changed. The “Recording Centre for the Blind” is now the Transcription Centre; not just for blind students, but also for sight impaired, partially sighted, dyslexic, dyspraxic and many other students with disabilities which prevent the access of traditional print. The widening of the Copyright Law has of course supported this development. And we are not just “recording”, we are providing a whole range of other accessible resources. But even back then, in 2005, you would think that this was really inclusive, right? We, the university were making our resources accessible for visually impaired students. Well, yes and no. Sure, we were transcribing material for individual students so that they could access it but what if … wait for it … we would design our resources from the onset so that they required minimum modifications to be accessible for a whole range of different needs?!? This means moving away from the medical model of disability to the social model, following the principles of universal design, creating multiple format versions in an accessible way so that everybody benefits. If and when we consider accessibility at the design stage, we create resources which don’t just benefit a selected few but everyone. This idea of universal design can and should be extended to our physical and digital environment, our policies and even teaching style. And this shift is gradually happening at Swansea University, also because the inclusivity agenda is being pushed more, top-down at all levels. Pockets of excellence are growing, we have the wonderful SAILS and SALT teams, we have the ISS Inclusivity Group; professional services are engaged in the conversation and people are willing to listen and act to create a more inclusive environment for learners, educators and staff here at Swansea. And I am very proud to be part of that! I wear the badge and I am looking forward to having my T-Shirt as well! But, and there is always a but, it’s a journey, we are not there yet and a lot more work, awareness raising and best practice teaching will have to be done! So if you spot me (wearing my rainbow coloured inclusivity badge) out and about and want to know more about accessible design just stop me right there – I am always happy to spread the word!